To secure any booking we require a deposit to be paid in advance. Deposit payments must be 'cleared funds' before a booking can be confirmed. Deposits are only refundable under the conditions set-out here within. Payments can be made online / over the phone using debit / credit card as well as by digital bank transfer, cheque or cash. Any charges raised against us by our banks for handling dishonoured cheque's, bank transfers or any other payments, must be reimbursed by the lead guest within seven (7) days of any request to do so. （7）When a guest is an Organised Crime Group, a member of an Organised Crime Group or a party or other anti-social element related to such groups. Children up to and including three years of age can stay for free. Guests accept to use this access to the Internet fairly and appropriately. The Internet access provided is intended for general use such as access to the world wide web, email, messaging, social media, light streaming. It is not intended or ideally suited for heavy media streaming, online gaming, extensive downloads / uploads or any illegal activity. We reserve the right to charge the lead guest for any damages caused through the course of a booking by any member of the booking party. This includes breakages, spillages, stains, damage to furniture or fixtures and fittings. Any accidental damages should be reported as soon as possible in order to minimise damage and associated costs. Lost keys will incur a replacement charge. Guests are responsible for the safe keeping of all their personal items for the duration of their stay. We are not responsible for any damage to clothes as a result of its laundry services. Outside food and drinks are not allowed to be consumed on our premises unless otherwise explicitly agreed. Smoking is not allowed inside the rooms and only allowed outside in accordance with local regulations. We do not accept pets, unless otherwise explicitly agreed with the lead guest. Guests accept that they park their vehicles on-site at their own risk. We are required to keep a register of guests who stay with us. This includes a copy of passport/ID card showing full names and nationality, passport numbers, place of issue, and validity. These records are kept in accordance with governing laws and regulations, and for this purpose only. The Hotel shall compensate the Guest for any damage if the Hotel has caused such damage to the Guest in the course of its performance of, or by its non-fulfilment of, the accommodation contract and/or related agreements. However, this provision shall not apply in the event that such damage has been caused by a reason(s) not attributable to the Hotel. The Guest shall observe regulations established by the Hotel and posted on the Hotel premises, such as but not limited to swimming pool regulations. We reserve the right to cancel any booking without compensation, refund or reimbursement if the terms of these conditions are breached by the guest and/or their party. When selecting PayPal as payment method you will be given the option of paying by either credit card or by PayPal. Welcome to Siquijor Island known for its quiet beauty, hospitality, and peacefulness. 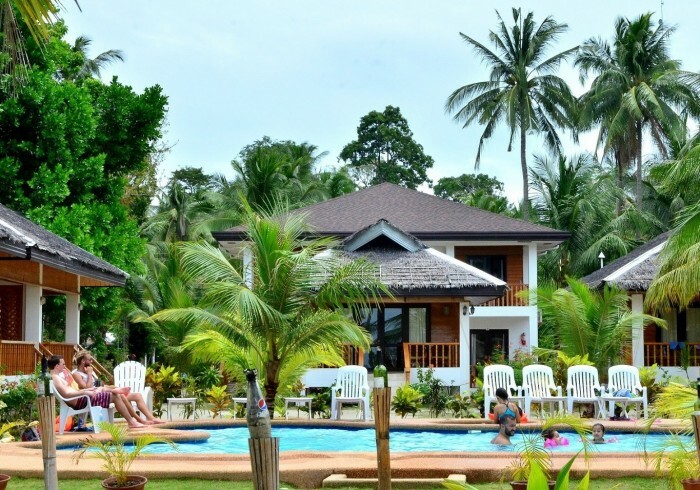 Our family–friendly resort on Solangon beach has easy access to the island’s many attractions. Enjoy relaxing by the beach, beach walking, taking our free kayaks out for a swim or snorkel around high tide, dipping in the pool, eating in our restaurant by the sea, or having a sunset drink. The sea view is great and the sunsets often spectacular. Our beach is not always the best for swimming, but there are other good swimming beaches nearby. Wi-Fi is free throughout the resort. We rent out motorbikes and organise island tours by car or tricycle. Swim sand jump in waterfalls, go cliff jumping, explore caves, visit the island’s famous faith healers and much more. Siquijor diving and snorkeling is world class and the nearest dive shops are just down the road. We are 15 minutes from Siquijor Town and offer free complimentary pick-ups from Siquijor Port and Siquijor Airport. Please call a few hours in advance to arrange. December-June is high season. The July-November monsoon season is also popular and cooler.